Join a flock of dancing birds for a forest fiesta in Feather Frenzy. This 5 reel, 20 payline video slot has been created by Novomatic and comes with a bonus round that awards 10, 15 or 25 free spins. Look out for special key symbols that award extra cash prizes. Play on all devices from between 20p and £40 per spin. There’s a real party feel to the design in Feather Frenzy. That’s not something we usually write about a Novomatic video slot, let alone one that is set in a forest. On the reels you’ll see lemons, grapes, cherries and melons as well as a quartet of flamboyant dancing birds. The best of these is the blue bird which pays 0.25, 2.5, 10 or 100 times your total bet if you land 2, 3, 4 or 5 on 1 of the game’s 20 paylines. The diamond is the game’s wild. This can appear on all 5 reels. As usual it substitutes for all of the standard symbols. The bird’s egg is the bonus scatter. Land 3 or more of these on the same spin to trigger the Free Games feature. On offer here are 10, 15 or 25 free spins. Joining the action are keys which can land on reels 2, 3 and 4. These keys can unlock caged birds and awards cash prizes up to 100 times your bet. The prize is repeated for each key on display. The design in Feather Frenzy is actually pretty good. The dancing birds are nicely drawn and there’s a catchy, salsa style backing track playing while you spin which is a big improvement of Novomatic’s usual generic soundtrack. This isn’t as volatile as some slots from the Austrian developer. The variance here is in the medium range which offers a balance of payouts – you can win 2,000 times your bet if you fill the reels with the blue bird symbol. If you add in the cash prizes of up to 100 times your bet from each caged bird, the feature can be quite lucrative. Dancing forest birds seems an unlikely theme for an entertaining video slot but that’s just what Novomatic has delivered here. It’s a very simple game and the range of extras is limited so if you’re looking for plenty of variety, you’ll be better served elsewhere. 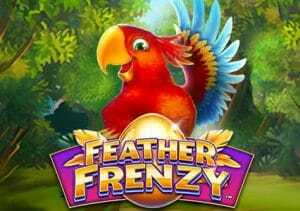 With straightforward gameplay and bright and breezy design, you won’t go too far wrong enjoying Feather Frenzy. If you like birds, Thunderkick’s Birds On A Wire is recommended as it offers wins of up to 9,000 times your bet on each free spin.